Hello everyone, hope you are getting ready for Christmas cooking and “eating a lot”. I love this period of time as I have plently of time to cook and taste a lot of delicious recipes. In fact during this period, you would see me wandering around the house with my favourite apron on and on the other hand I always end up having a lot of kitchen wares to wash, lol. 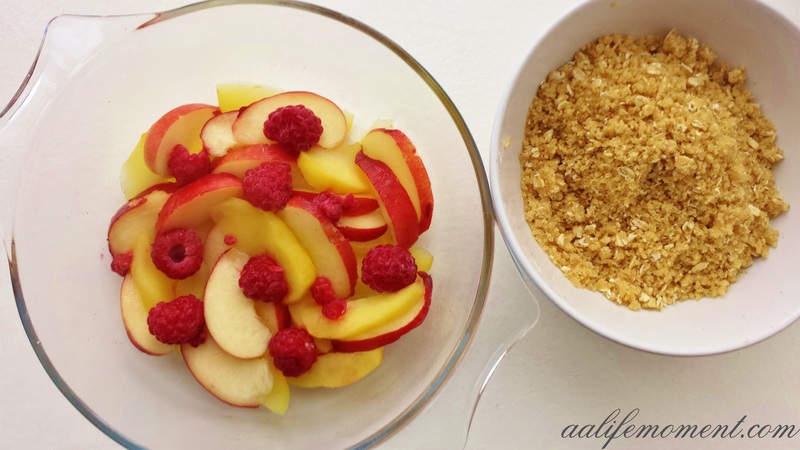 But while waiting for the “heavy stuff” to cook, I always like to have my favourites comfort food recipes and one of those is definitely the apple crumble with peach and raspberries. I love the taste of these three fruits together as there are 3 different level of sweetness and apart from that, I like to add to the crumble some oats which help create that perfect healthy crunch. 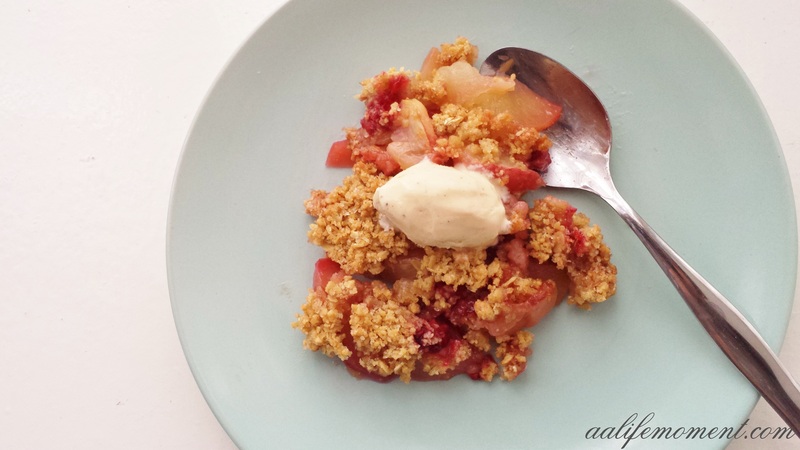 I think it is the perfect simple recipe to make and is a great version of the good old apple crumble. First of all, add on a bowl the flour, the oats, the butter, 1 cup of brown sugar and mix really well all the ingredients together (I used my hands for this), after that leave aside. Mean while peel the apple, cut it into medium-thin slices and put them on a sauce pan to boil with the rest of the sugar for about 5-8 minutes until they are slightly tender. The next step is to drain the apple slices and place them on medium-small size pirex, then cut the peach into slices and place them on the pirex as well ( I didn’t boil the peach as it was very soft) followed by the raspberries. After that, place the crumble on the top making sure to level it neatly, then cook in the oven for about 25 minutes or until you see the fruit juice bubbling on the top of the crumble. When cooked leave to cool for about 5 minutes then serve. I accompany it with some vanilla icecream but you can use cream or custard instead. 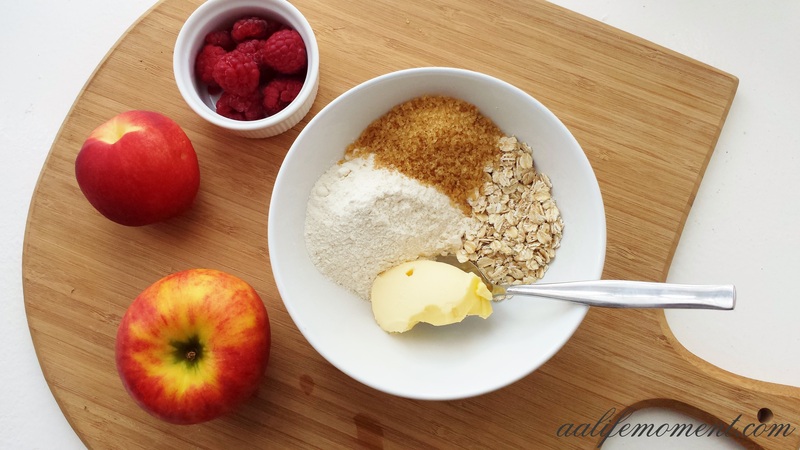 I really hope you will like this version of apple crumble, I think the peach and raspberries enhance the apple flavour by adding some very interesting texture and aroma, plus the oats in the crumble does really make the difference. Please do give it a go as it is very easy to make, it has fresh fruits and simple ingredients as well. Oh yummy! I bet the addition of peaches and raspberries make it nice and tart! Thank you so much Leslie I am happy you like it! That is one of my favourites! Looks not only delicious but beautiful too! Awww thank you so much for the nice comment DailyMusings, I really do appreciate. 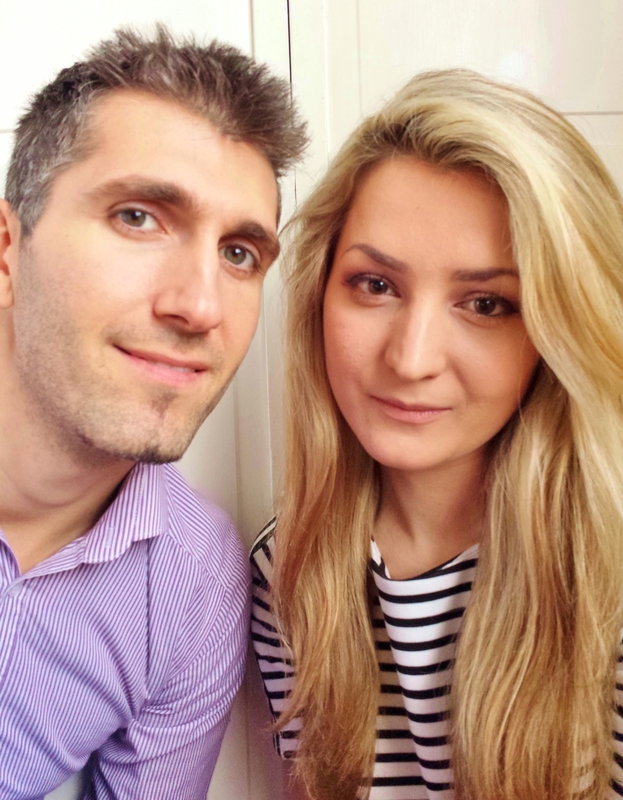 Please do give it a go, I would love to hear how it goes from you! Thank you so much for the lovely words CookltSlim, I am happy you like it. 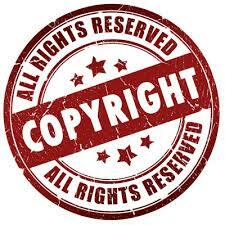 Please do give it a go, I am sure you will like it as much as I do. Thank you very much firecook for the nice comment. I really do appreciate! I looove crumble in all forms! It is such a humble and comforting British pudding that brings back all sorts of childhood memories for me. 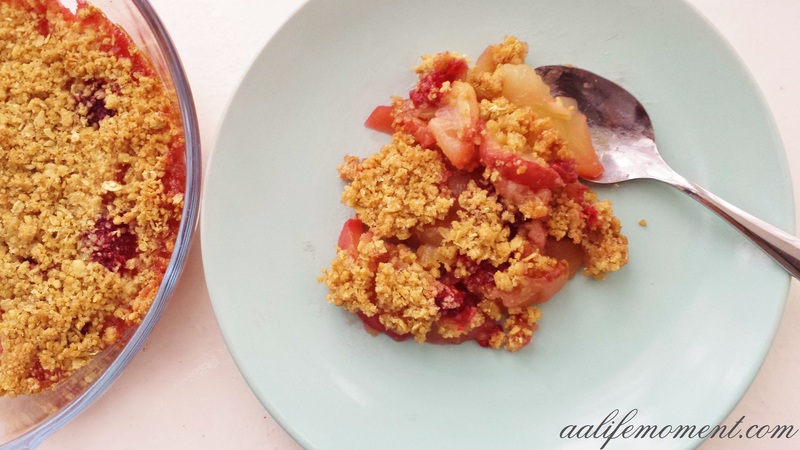 I have tried peach and apple crumbles separately but never thought to combine. Thanks! 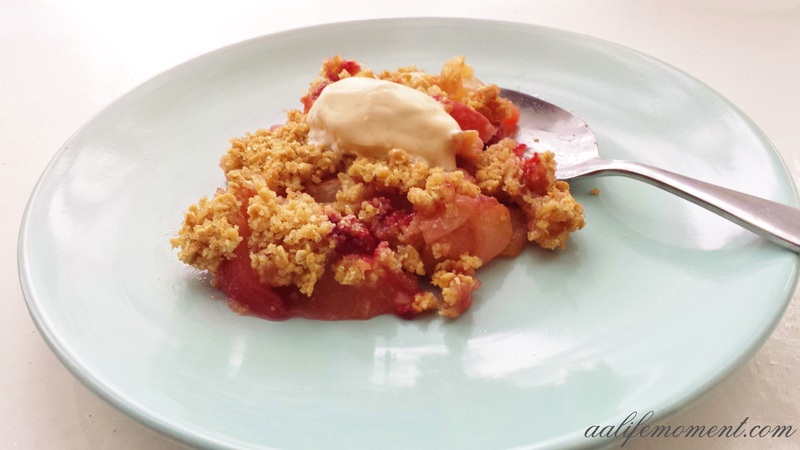 I love crumble, too and since I have apple crumble very often, I wanted to give to the recipe an exciting twist and the three fruits together blended perfectly (even my husband loved it). Please try it, it is a faultfree recipe. I am 100% sure you will like it.